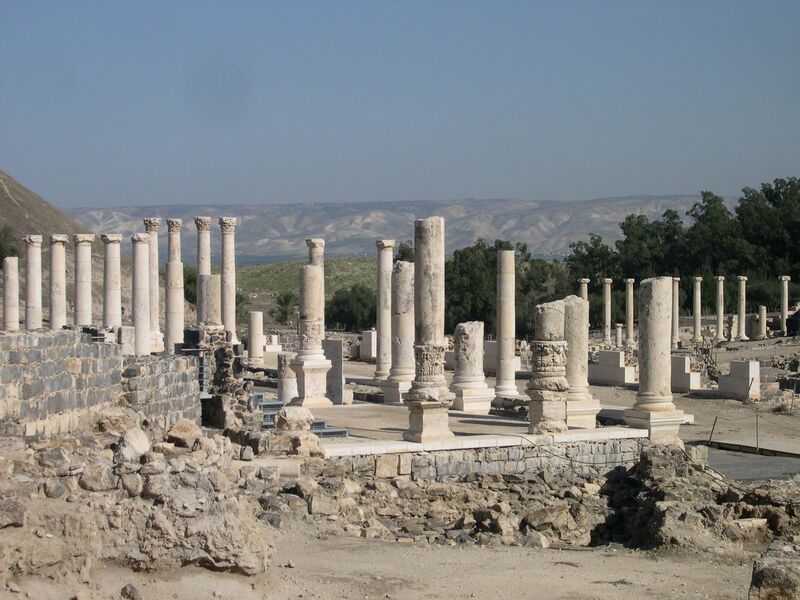 Bet Shean situated at the junction of the Jordan River valley and Nahal Harod that connects to the Jezreel valley, is an important crossroads because it controls access from the interior to the coast and from Jerusalem to the Galilee. It was called Scythopolis from the Hellenistic period onward and according to Greek mythology was founded by Dionysus. In 63BCE it was conquered by the Roman general Pompey and made a part of the Decapolis, a loose confederation of ten cities that were centers of Greco-Roman culture. It was the largest city according to Josephus and only one west of the Jordan River and is mentioned several times in the New Testament (Matt 4:25; Mk 5:20). This was the period of Pax Romana and the city prospered, evidenced by a high-level of urban planning and extensive construction the remains of which can be seen today in the archaeological park. You can explore the site and visit the best preserved Roman theatre, a public bathhouse, two magnificent colonnaded streets, a Roman temple, a decorative fountain building (nymphaeum) and other landmarks of a Roman city. 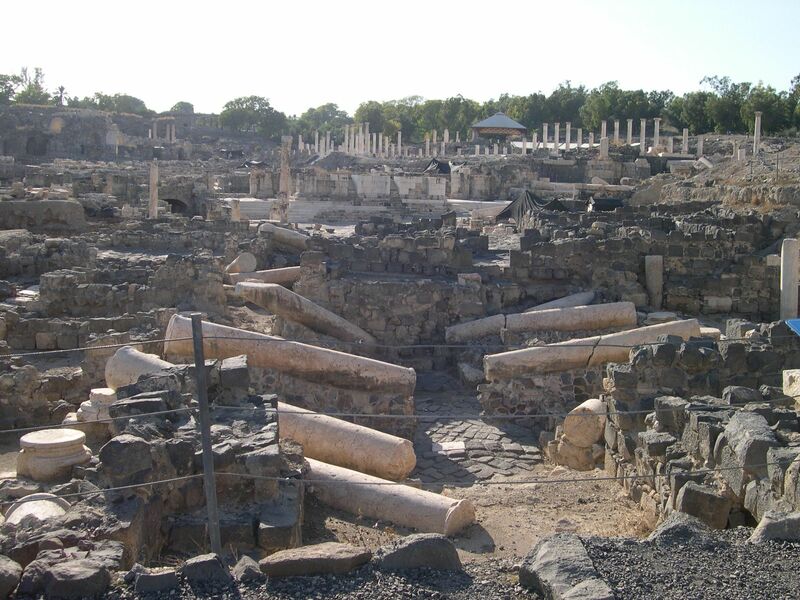 Ancient sources indicate that Scythopolis had a mixed population of pagans, Jews, Samaritans, and Christians. At the western end of Tell Ictaba stood the sixth century Monastery of Lady Mary with a beautiful mosaic floor that depicts the 12 months and the sun and moon as human figures. Outside the city wall a Samaritan synagogue dating to the 5th–early 7th centuries CE was discovered. Its apse is oriented northwest towards Mount Gerizim (not south towards Jerusalem) and the floor is covered by a beautiful mosaic with geometric and plant motifs, but no human images. Another synagogue known as the “House of Leontis” perhaps part of an inn was found with a mosaic floor depicting geometric, animal, and plant motifs, and in the center, a medallion containing a menorah and the Hebrew word shalom. Another mosaic in the complex depicts scenes from Homer’s Odyssey, a five-branched candelabra and scenes of the Nile. In 634, the second caliph, Omar Ibn al-Khatab took the city on his march through to Egypt. and it reverted back to a variation on its Semitic name, Beisan. The Muslims and Christian majority lived together but the city declined, additional structures were built on the streets themselves, narrowing them to mere alleyways, and makeshift shops were opened among the colonnades. Visitors to the Israel museum can to see the gate of the Umayyad shopping street inlaid with Arabic mosaic inscriptions. On January 18, 749 Beisan was completely devastated by a massive earthquake. A few residential neighborhoods grew up on the ruins but the city never recovered its former glory. Looking across the site you can’t but notice a hill that rises 50m above the city. It’s worth climbing the stairs to the top for a spectacular view of the city and Bet Shean valley. Looking over the fertile surrounding countryside Rabbi Shimon ben Lakhish (ca. 350CE) wrote that if the Garden of Eden is in the Israel, then its gateway is Beth-Shean (Eruv 19a). This tel was first investigated from 1921 to 1933 by archeologists from the University Museum of the University of Pennsylvania. As a result of their work, Bet Shean became the first tel in Israel to produce a complete stratigraphic sequence spanning more than 18 layers of occupation from the late Neolithic period (fifth millennium BCE) through medieval times. Level IX dated to around 1450BCE, was an Egyptian garrison after Thutmose III’s victory against an alliance of 300 Canaanite rulers. A few hundred years later, the Philistines conquered it (it was they who fastened Saul’s body to the wall of Bet Shean after the famous battle on Mount Gilboa: 1 Samuel 31.8–11). Bet Shean became part of the kingdoms of David and Solomon, and was eventually destroyed in a fire, apparently at the hands of Tiglath-Pileser III, King of Assyria in 732 BCE. This entry was posted in Archaeology, Mosaics and tagged beit shean, postaweek2011, tel on January 16, 2011 by Shmuel Browns.